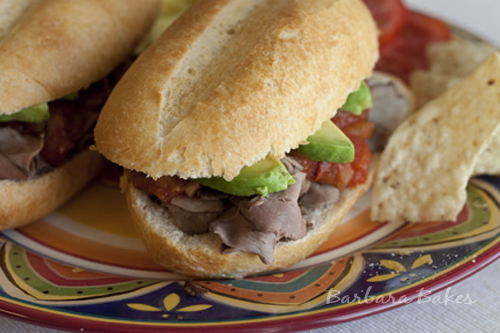 Today I have a sandwich recipe for you for Cinco de Mayo. 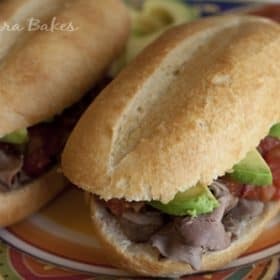 I had never tried a Torta Ahogada sandwich before but according to a great new sandwich cookbook, 400 Best Sandwich Recipes, “this popular sandwich from Mexico (usually in Guadalajar) is also called “Drowned Beef.” It is submerged partially or totally in a spicy sauce. This is a less spicy version made with tomato sauce, but it has a fabulous kick.” I can see why it’s such a popular sandwich. It really kicks a roast beef sandwich up a notch. I was so happy to receive a copy of this new cookbook to review. My sweet friend, Alison Lewis, who I met while we were contestents in the I Can’t Believe It’s Not Butter Bakeoff last November is the author. This is Alison’s first cookbook but she’s been working in the food industry for a long while. She blogs at Ingredients, Inc. where she creates healthy, family-friendly recipes that are easy to prepare. 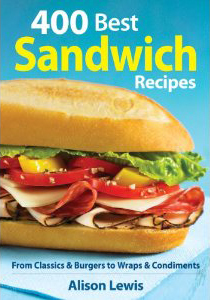 The cookbook is arranged by type of sandwich. So it’s really convenient to locate a recipe for the type of sandwich you’re craving. It has a breakfast sandwich section, a burgers, a wraps, a light and healthy sandwich section and more. One of my favorite sections is the condiments sections. A great condiment can make an okay sandwich great. I’m especially looking forward to trying the Chipotle Aioli next time I make a burger. 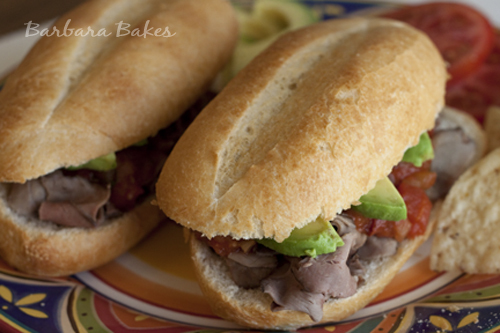 The Torta Ahogada recipe uses deli roast beef so this delicious, spicy sandwich comes together quickly. It’s a Sloppy Joe kind of messy sandwich, so make sure you have some napkins handy! In a medium saucepan over medium heat, combine tomatoes, tomato sauce and chipotles. Bring to a simmer, reduce heat to low, and cook, stirring occasionally, for 15 minutes. In a large nonstick skillet, heat oil over medium heat. Saute onion, garlic and jalapeno for 5 minutes or until tender. Add onion mixture to tomato sauce mixture, stirring well, and simmer for 5 minutes. Stir in cilantro. Place rolls on a work surface. Arrange roast beef equally on bottom halves of rolls. Top with beans, if using, tomato sauce and avocado slices. Cover with top halves of rolls. Serve immediately.